The name "Hobo" first started appearing in the early 1800's. Before the Civil War many hobos had taken to the rails as a way of life. Around the time of the Civil War, railroads were being built a an astonishing rate and in the early 1870's there were between 50,000 and 60,000 miles of track interwoven throughout the United States. 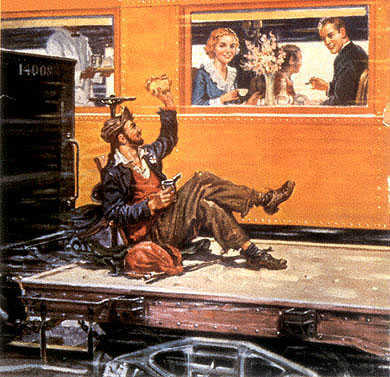 During the early days late 1880's a depressed economy was certainly prevalent, times were hard and hoboes took to the rails in great numbers, hitchhikers were also increasing, nobody had any money to go anywhere and pay the ticket to get there. By the 1930's this had grown to about 241,000 miles of track and the trains were running to all the bustling markets, Chicago, Michigan and from all points south to move raw goods to the industrial northern areas, hauling cattle grain and everything else imaginable. Some during the early days would say that the hobo was one into doing a lot of bad things, stealing and you name it., that they would derail trains and take over the entire train. But in the rural communities people would help them and give them jobs during the harvest time. Every hobo had a thing that he do real well, repair shoes, make wire fruit bowls and he sure could hoe a garden for a little something to eat. Many could play good music with a guitar or harmonica, or some other musical instruments. It was not uncommon to see a hobo standing in the rear of a house drinking a cup of coffee and eating a sandwich, standing up, then doing a little chore for the donor of the coffee and food. In around the time that World War 1 was was raging and we were yet to join in the war, hoboes were running rampant, trying to get into a stable work force and maybe settle down and some did, but the number continued to grow. By the 1920' the unsettling image was making a change , there were some very notable people that had rode the rails, among them Jack London, and author Carl Sandburg, they made it big in their field so many people took this to mean that there were some that had it all together and could make a go of it , without living around a bunch of trains. A clown made up as a hobo caught a lot of attention , what they really did was depict a way of life in America, some people could relate to that. During the Great Depression over 8,000 women & over 200,000 children rode the rails as well. In 1932 the Bonus marchers arrived to pressure Hoover for their long awaited bonuses, and they were not the same as the hobo who was resourceful in making his way and not starving, he made it on the ability to get by, they improvised when the chips were down.. The center of the hobo life as the camp's or jungles, which were located wherever it was most convenient , preferably close to a railroad track. Generally on the sunny side of a hill near a source of water; and as close as as possible to the tracks. No real names were given, you used a moniker like Luther the Jet, Hobo Joe and Greenie, Cinder Box Cindy, Oklahoma Slim, Guitar Whitey, Mister Bojangles, Midwest John, Boxcar Willie (see story below), Gats, New York Maggie, Photo Boll, Pig Train, North Bank Fred, New York Ron, Liz Lump, Senator John McClaughry. There were certain rules, pots were left clean, no fellow hobo was to rob another one. ( who came into camp ) Thievery was to be kept to a minimum, maybe a piece of food taken or vegetables taken from a garden or something off the clothesline. There was to be no breaking into any house or threatening people, these were serious offenses and could bring death by a fellow hobo. Hobo's rode freight trains nearly always. Greenie told me that he always carried a railroad spike with a gold painted tip, so he could identify as his. He would use this to keep the railroad yardman from closing the door on him, which could result in him freezing to death or suffocating, as some freight cars were pushed into the rail yard and out of use for weeks at a time. In the period leading up to World War 2 saw many hobos, going into the 3-c camps and then into the army and serving in World War 2, afterward some would take advantage of the GI Bill and enter college or other professions. After the war the numbers of hobo's declined rapidly. What used to be up to 500 on a freight train in the early 50's would only turn into around 10 hobo's on a fully loaded freight train. So the handwriting was on the wall, they were a group that would be almost extinct in the years to come, but a few still lead this life, but the number's remaining are limited. Boxcar Willie: In Branson, MO., Well known Hobo and Country singer BoxCar Willie is back on track in his battle against leukemia. The 67-year-old entertainer returned home from the hospital Tuesday March 2, 1999, he had received chemotherapy. He had been hospitalized for two weeks after cancer treatments left him ill and weak. "He's doing a little better," said his daughter, Tammy LaCore. BoxCar Willie was diagnosed with leukemia in 1996. He was then declared cancer-free in 1997 and returned to performing. But the disease returned last April, forcing him to cancel his shows in Branson. Born Lecil Martin in Sterrett, Texas, in 1931, BoxCar Willie was the son of a railroad man who used to play his fiddle on the porch while his son sat in on guitar.By his teens he had graduated to playing in jamborees all over the state, but he gave up show business to enlist in the Air Force. He spent 22 years there, logging some 10,000 hours as a flier, Boxcar Willie die 12 April 1999 at the age of 67. He is survived by his wife, two daughters and two sisters.